Serving Palo Alto, Menlo Park, Redwood City and the San Francisco bay area. Limey Roofing is a family owned and operated roofing company located in Redwood City, California serving the San Francisco Bay Area (Palo Alto, Menlo Park and Redwood City) since 1988. We specialize in all types of roof installations, roofing repair and replacement services. Our focus is on 100% on client satisfaction and getting the job done right. We want to keep our customers happy. We offer a 10 year workmanship guarantee. Limey Roofing provides installation services for roofs including shingles, tiles, bitumen, rain gutters, insulation, skylights, solar panels and solar tubes. We're experienced with both pitched and flat roof repair and replacement. As a roofer in the industry for over 26 years, we also offer expert roof repair for dry rot, leaky roofs, water or rain rot damaged roofs, and termite damaged roofs. Recently, we also added solar panel cleaning and maintenance to our list of services. Contact us below for a Free Estimate, or learn more About Us, our Services and the Products we use. 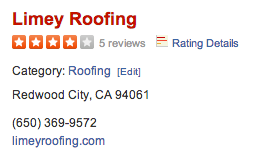 "Ian and his son Chris did an excellent job on our roof. They came up with a game plan to fix our flat roof for optimal water drainage and even addressed some termite damage. Ian takes pride in his work and it shows."